Here is an actual quote from an Advanage 20X customer. She makes four key points about Advanage. “The cleaner was used for every bit of household cleaning we needed, and one bottle lasted us a year because it takes so little to be mixed with water to do some powerful cleaning. When a slightly more potent mix of it is left to sit for only a few short minutes on oven grease, it wipes off as though something had just been spilled there a moment ago! The smell is very pleasant and after use and I have no concerns with my dogs or our child being subjected to chemicals from mopping, etc. In Independent laboratory tests for cleaning effectiveness, super-concentrated, eco-friendly ADVANAGE Multipurpose Cleaner out performed all other cleaners in its class. ADVANAGE scored 96% – far outdoing the leading brand name retail cleaner which only scored 87%. Rigid testing for cleaning effectiveness was conducted in eleven areas including ceramic and vinyl tile, semi-gloss enamel, Formica counters, stainless steel and all areas of restrooms and grease-soiled surfaces. 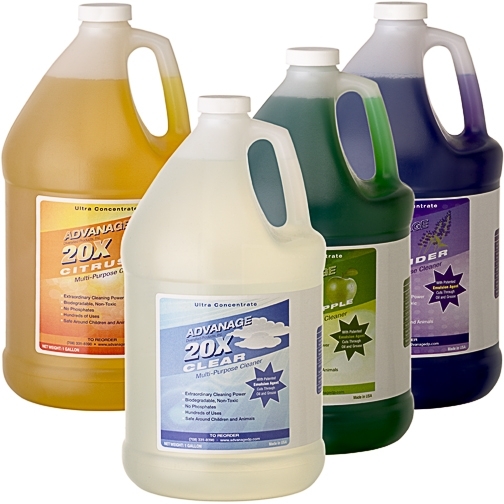 For more information about ADVANAGE 20X Multipurpose Cleaner go to www.advanage20x.com or call 877-588-8391. Harmful cleaning products can cause “dead zones” in our water. Cleaning products with phosphates can cause “dead zones” in lakes and streams. Dead zones are areas in our oceans, lakes, and streams that contain little to no oxygen, and are therefore unable to support aquatic life. These dead zones are caused by pollution from human activities. Detergents used in many liquid cleaners are rich in phosphates which cause algae and plankton to flourish in waterways. These algae use up all the oxygen, leaving these dead zones where no fish or other plant life can flourish. We all have an obligation to protect our environment and leave this place pollution free for our children and future generations. One multipurpose cleaning product that is eco-friendly is ADVANAGE 20X Multipurpose Cleaner. It is non-toxic, biodegradable, phosphate free and safe around children and pets. For more information go to www.advanage20x.com or call 877-588-8391. One of the toughest industrial cleaning jobs is removing tire marks from your garage or hanger floors. If you do not remove these promptly, the buildup can really accumulate into an unsightly mess. The fastest and easiest approach clean them up is to use an industrial floor scrubber. Use a liquid cleaner with a high-powered surfactant (surface active agent) so that stubborn rubber marks are emulsified with your liquid cleaner. This way you’ll get a clean floor, free of scuff marks. You should also maintain a regular sweeping schedule. Remove any debris, oil and grease that might be left behind. Not doing so can make the concrete or asphalt deteriorate faster which can cause premature cracks. These can create potholes, or even sink holes in certain situations. Clean up any spills immediately, Spills can often have bigger consequences as they sometimes leave hazardous fluids on the garage or hanger floors. Train your employees and make sure they are aware of the dangers in letting spills, oil, grease and debris build up over time..
ADVANAGE 20X Multipurpose Cleaner, with its powerful, patented surfactant, is the ideal liquid cleaner to use for cleaning up tire marks and just about everything else. And it is eco-friendly, non-toxic, biodegradable, phosphate free and safe around children and animals. For more information go to www.advanage20x.com or call 877-588-8391. Come travel with me. Make $200 or Better Each Day. Get information, directions, products, services, phone numbers, and reviews on Advanage Diversified Products Inc. in South Holland, IL.